One of the unique things about BJJ is that you can train all year round but you can also participate in competition all year round! Gi, No gi, sub only, IBJJF or local competitions your choice is endless! But whilst this is great in one aspect as you can always throw yourself into another competition to help continue your winning streak or to correct your mistakes it means that you also don’t take your foot off the gas. In one respect BJJ is very honest, if you’re not training, the results on the mat will mirror your effort. But is it realistic to keep the same pace all year round, your entire BJJ journey? And are all the relentless messages about training more and embracing the grind that helpful or healthy? Blog spoiler – there is no simple black or white answer! It really is a personal thing! Ultimately it comes from two perspectives preventing burnout (and being fed up of BJJ) but also avoiding being ill or injured which we all know is really dull and severely limits your mat time! Firstly sickness, every October usually between the 9th-15th to be precise for the past few years I have fallen ill with cold. Although it is when there is a change of seasons and a typical time for cold and flu to go around. I strongly believe it’s also linked to the fact is that is also the time of the year where I have returned from the Worlds. Then pushed myself to a Judo comp before eating myself pretty silly. Increased infections combined with a number of other symptoms including insomnia, increase fatigue/aching, headaches and a drop in performance aren’t just a sign of hard competition prep but are actually a potential sign of overtraining syndrome. Now there has been a host of research regarding cortisol (one of the main stress hormones) and there are things you can do to reduce your levels including monitoring, sleep management and supplementation (2) but ultimately rest and reduced training intensity are one of the most effective methods. It’s also worth adding here that injuries are one of the other signs of overdoing it and potentially needing a break is an increased incidence of injuries (and I’ve had an interesting year of them!). You cannot put your body through consistent high-intensity training without a chance to recover. Active rehab, prehab. and physio. work can only do so much. Finally, the concept of mental burnout and dare I admit it – getting fed up with BJJ! This is where it gets quite personal as everyone feels different. I’ll be honest I don’t think I’ve suffered from the classic textbook definition of burnout but I have reached a stage where BJJ started to feel like a second job and that competition training and training generally just stopped being that much fun! I’ve found since admitting this it is one of those things that many people experience but few admit to. Which let’s be honest it’s not surprising. 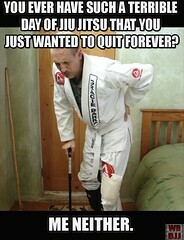 Jiu-Jitsu has a culture of being not just a lifestyle but also promoting the idea of train, train and train some more. But think about it is it really surprising that it happens? Your limiting nights out or having restricted xmas celebrations (due to weight cuts). Your scheduling life and home to maximise mat time and have a seemingly endless training routine. That’s before all the competition highs and lows and that’s just the stuff that happens off the mats! On the mats you need to make every training minute count, you’re very focused on competition based jiu jitsu and as a result, can end up with a pretty linear or one side game. It can be exhausting! Taking a break can really give you the chance to work on your weakness, data collect on your jiu-jitsu game and get the chance to generally play at training – starting in bad positions, rolling with people you don’t always roll with and a whole host of things including a chance to remember why you fell in love with the sport in the first place! I have no idea if taking a break from competition will help me in the long term but it is giving me the opportunity to heal my niggles and to play around much more with my jits game. It’s definitely better than the alternative which would have seen me leaving the mats sooner rather than later! I have found training without a competition goal difficult at times but for now, I am focusing on enjoying my first crimbo (without dieting) in a few years and then making plans from there! One thing I do know that whilst I have enjoyed my short term goals of competing as a blue belt I do need to keep my eye on the ultimate goal of rolling until I am really old and wrinkly and to see where that takes me!